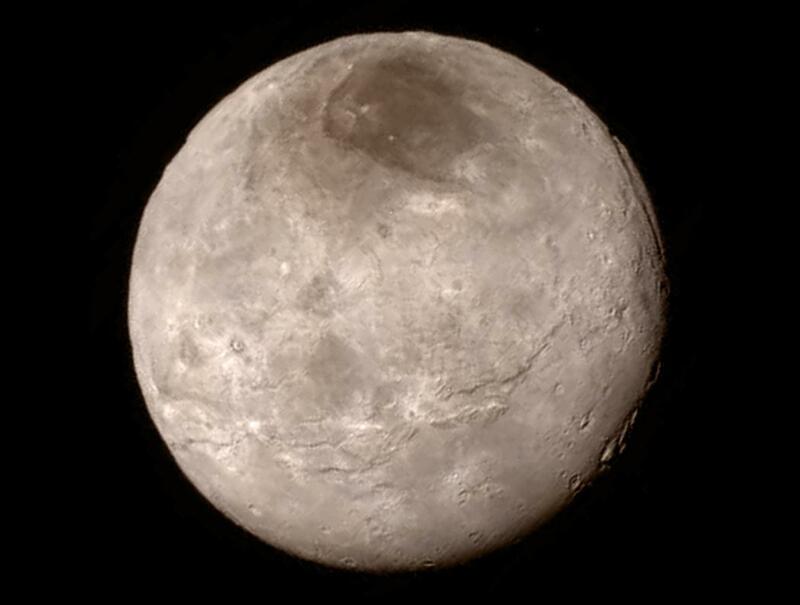 Explanation: Icy world Charon is 1,200 kilometres across. That makes Pluto's largest moon only about 1/10th the size of planet Earth but a whopping 1/2 the diameter of Pluto itself. Charon is seen in unprecedented detail in this image from New Horizons. The image was captured late July 13 during the spacecraft's flight through the Plutonian system from a range of less than 500,000 kilometres. For reference, the distance separating Earth and Moon is less than 400,000 kilometres. Charonian terrain, described as surprising, youthful, and varied, includes a 1,000 kilometre swath of cliffs and troughs stretching below centre, a 7 to 9 kilometre deep canyon cutting the curve of the upper right edge, and an enigmatic dark north polar region unofficially dubbed Mordor.